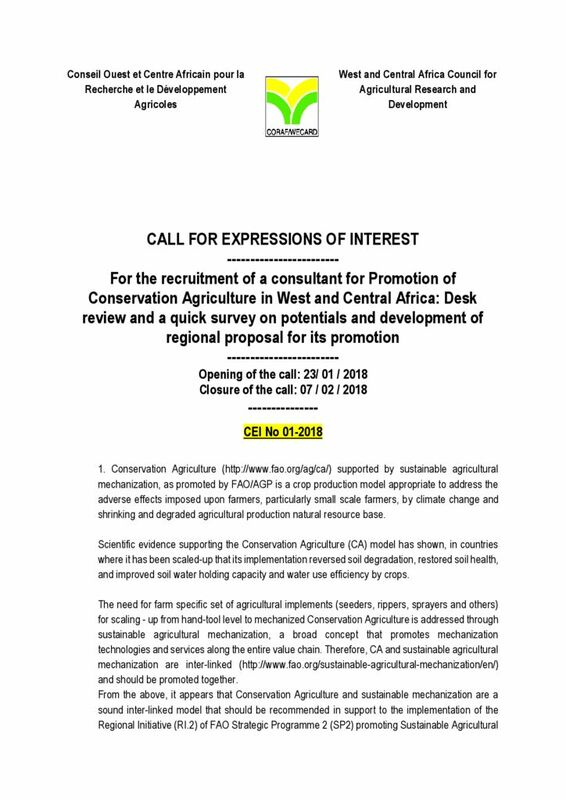 Home Procurement CEI No 01-2018: For the recruitment of a consultant for Promotion of Conservation Agriculture in West and Central Africa: Desk review and a quick survey on potentials and development of regional proposal for its promotion. Conservation Agriculture (http://www.fao.org/ag/ca/) supported by sustainable agricultural mechanization, as promoted by FAO/AGP is a crop production model appropriate to address the adverse effects imposed upon farmers, particularly small scale farmers, by climate change and shrinking and degraded agricultural production natural resource base. Scientific evidence supporting the Conservation Agriculture (CA) model has shown, in countries where it has been scaled-up that its implementation reversed soil degradation, restored soil health, and improved soil water holding capacity and water use efficiency by crops. The need for farm specific set of agricultural implements (seeders, rippers, sprayers and others) for scaling – up from hand-tool level to mechanized Conservation Agriculture is addressed through sustainable agricultural mechanization, a broad concept that promotes mechanization technologies and services along the entire value chain. Therefore, CA and sustainable agricultural mechanization are inter-linked (http://www.fao.org/sustainable-agricultural-mechanization/en/) and should be promoted together. From the above, it appears that Conservation Agriculture and sustainable mechanization are a sound inter-linked model that should be recommended in support to the implementation of the Regional Initiative (RI.2) of FAO Strategic Programme 2 (SP2) promoting Sustainable Agricultural Production Intensification and value chain development in Africa. However, while CA is promoted in Southern and Eastern Africa (Zimbabwe, Zambia, South-Africa, Tanzania, and Kenya) by FAO and other institutions, it is hardly known in West and Central Africa and has almost never been tested in the francophone countries of these geographical areas of the Continent. Therefore, CORAF has inter into partnership with FAO to promote CA in its geographical area of intervention. The present ToR are developed to recruit an individual consultant for evaluating the status of practice of CA and develop a regional proposal for its promotion. The tasks to be performed and other information relating to the conduct of the mission are detailed in the attached Terms of Reference. 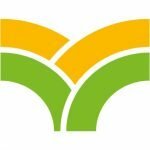 The Executive Director of CORAF/WECARD invites consultants with the profile sought as indicated in the terms of reference to express their interest in this appeal. Individual consultants should provide a record of expression of interest consisting of: (i) references concerning the performance and experience of similar services, (ii) and their updated CV. The individual Consultant will be selected using the selection based on the individual consultant (IC) method in accordance with the World Bank guidelines on “Selection and Employment of Consultants under IBRD loans and IDA Credits & Grants by World Bank Borrowers, January 2011, revised on July 2014”. Interested consultants may obtain additional information from CORAF/WECARD Executive Secretariat by sending correspondence n.lamien@coraf.org with copy to procurement@coraf.org from 8am to 12pm and from 15h to 17h GMT. Expressions of interest must be submitted by e-mail to: procurement@coraf.org l, on 07 / 02/ 2018 at 10:00 GMT at the latest.